Hello lovelies! I have a fun and exciting project to share with you today! Here at Fiber Flux headquarters, I'm launching several CALs to kick off 2019...this January we've launched the Temperature CAL, and coming soon will be the Stashdown CAL too! BUT, I have one more to share with you today, a very special one that I've been wanting to do for a couple of years now...a Charity CAL! On my own, I normally do charity projects throughout the year...baby hats, shawls, etc. and send them off for donation. I thought it would be fun and meaningful to share these types of projects by partnering up with a charity each year to make a community-wide effort to help those in need. This year we're partnering up with S.A.C.K. (which stands for Supporting A Community With Kindness). 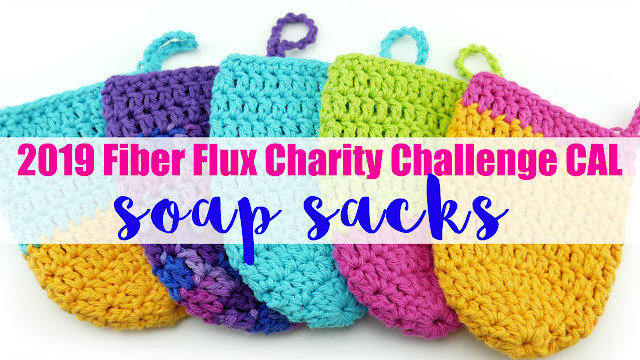 This is a wonderful organization that gives back to communities by providing a bar of soap in a beautiful, yet simple handmade little "sack" or pouch. 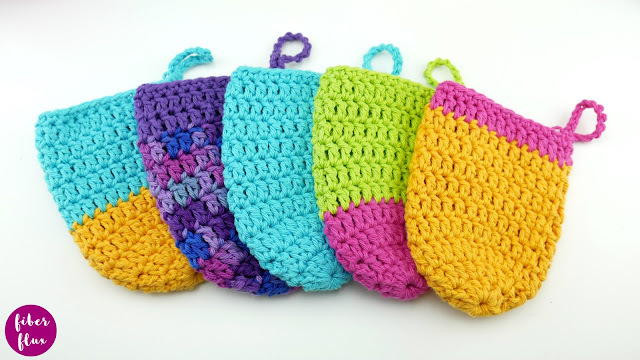 Soap and personal care items are always a high demand item and the pretty little pouch gives it a handmade touch to show that someone, somewhere cares. Plus, they can be very useful too! It helps those in need, and there is an urgent need! Each one takes small amounts of inexpensive and readily available cotton dishcloth yarn. 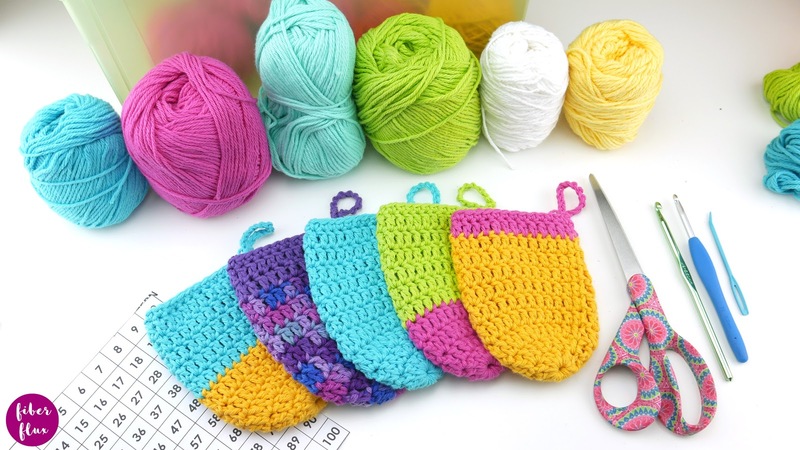 All you need is cotton yarn, "H" or "I" hook and a tapestry needle! The project is small so you can whip up a bunch. You can donate them to S.A.C.K. or distribute them locally on your own...your choice! So this year I am committing to making 100 of them in 2019 and I want to challenge you to get involved too! Make as many as you like and send them to S.A.C K. or on a local level if you prefer. 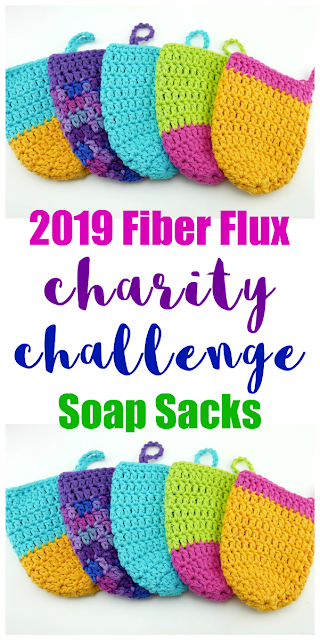 I can't wait to see all of your efforts...the Fiber Flux community is the BEST! As always with our year-long crochet alongs I will update in spring, summer, fall, and winter, culminating at the end of the year with a big wrap up! For more information about donating, check out the site HERE. It includes everything you need to get started! Please visit and join the Fiber Flux CAL group on Ravelry to get updates and see everyone's progress. Also, get questions answered, help others, and show off your work. Extra special thanks to Stacy at S.A.C.K. for partnering up on this project! I just donated 25 of these with soap to our local homeless shelter. They worked up quickly and were much appreciated. Amazon has good prices on brand name soap by the case. Thank you for a fun CAL- love it and the soap sack charity too! Love this kind of Crea Power! !